For example, the current world-record for efficiency (i.e., the ability to convert light into electricity) is 44.7%, held by a multi-junction solar cell used in concentrated photovoltaics. However, for various reasons, such systems are still expensive. Cheaper solar cells, such as the ones you can mount on your roof, are more reasonably priced but have efficiences only around 10 to 20%. Thus, the “holy grail” is to design a solar cell with high efficiency and low cost. One possible avenue is a design referred to as a dye-sensitized solar cell (DSSC). (Here is a video explaining how DSSCs work.) In a DSSC, dye molecules attached to titanium dioxide absorb photons and release electrons, creating an electric current. 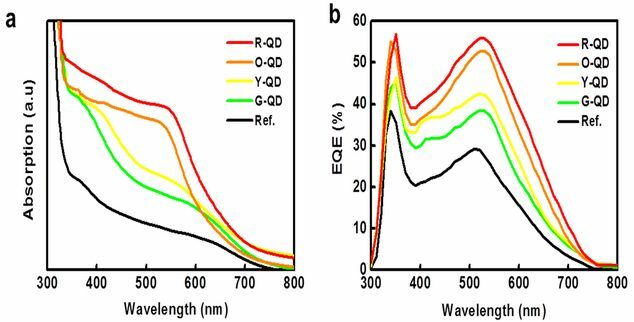 As shown above, DSSCs containing red quantum dots (R-QD) were the best at increasing both light absorption and external quantum efficiency (a measure of how many electrons are generated per photon absorbed). 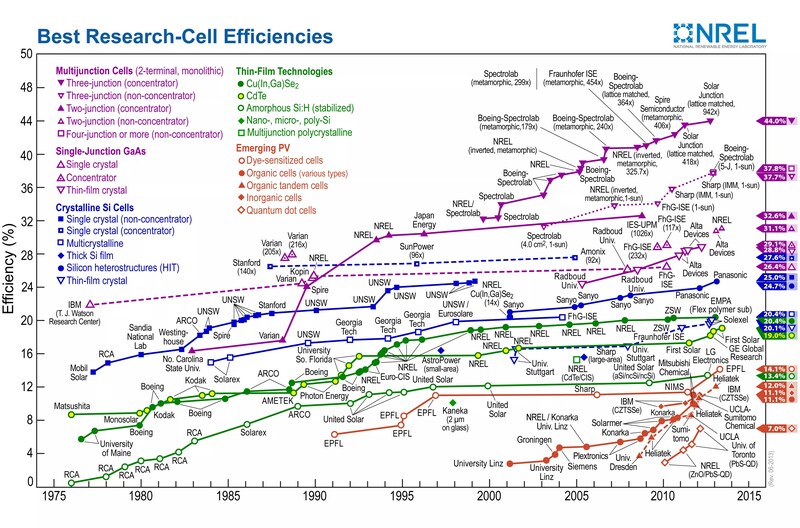 The authors told RealClearScience in an e-mail that the maximum efficiency of their system is 8.83%, which is obviously lower than most existing solar cell technologies. However, DSSCs are relatively cheap to produce, and with further research, they believe that they can crank up the efficiency way past 33.7% (the Shockley-Queisser limit, which is a theoretical limit on the efficiency of single junction solar cells). Techies and investors should keep an eye on this emerging technology.